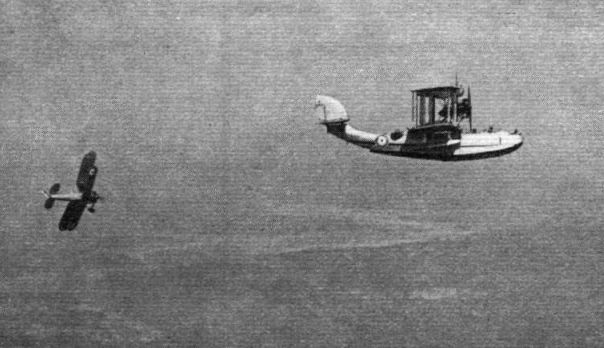 The Fairey IIID (Rolls-Royce "Eagle") in which Coutinho and Cabral made the first South Atlantic crossing in 1922. 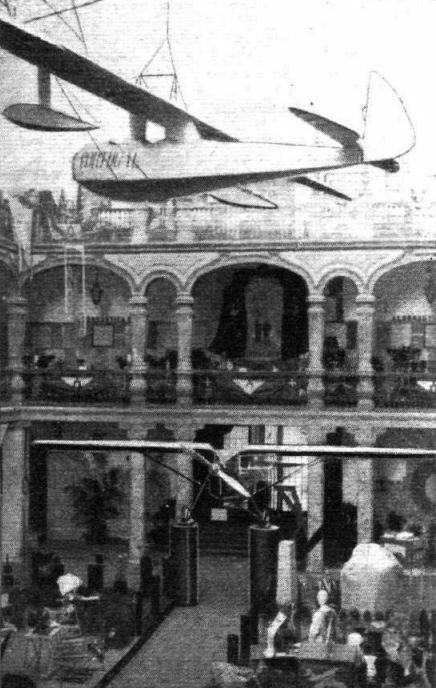 Behind it is another historical machine, a Schreck flying boat acquired by the Portuguese Naval Aviation Service in 1917. Fastest of the R.A.F. 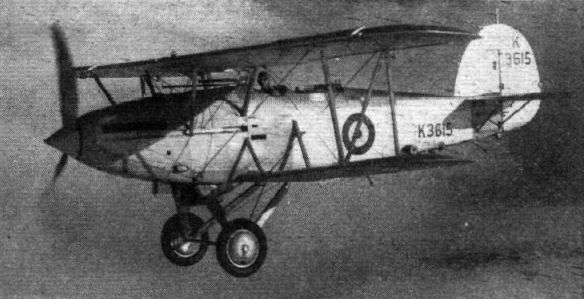 's bombing types, the Hawker "Hart" uses a 525 h.p. unsupercharged water-cooled "Kestrel." No. 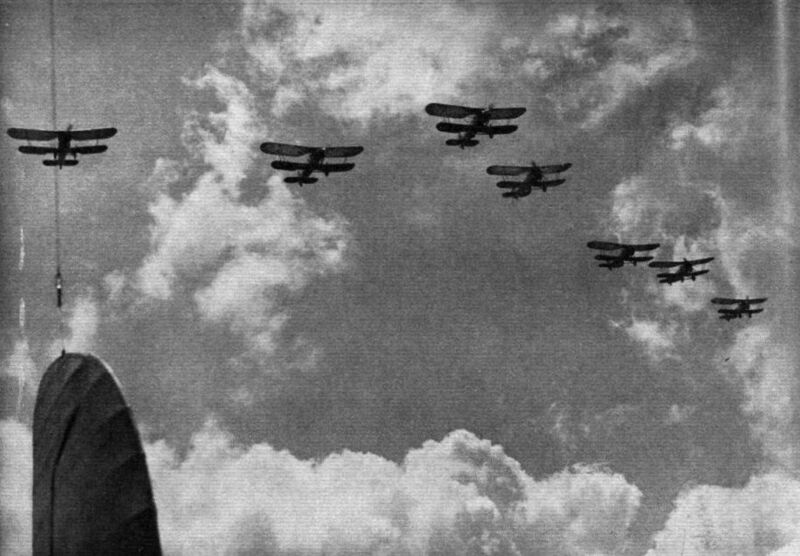 57 (Bomber) Squadron at Upper Heyford, flying the "Hart," which is the fastest light bomber in the R.A.F. SERVICE MODES. 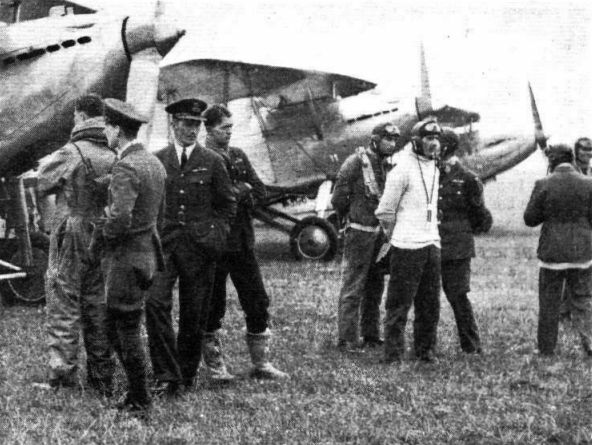 A group of pilots caught by a Flight camera during a rehearsal at Upper Heyford last Friday for the special formation-flying item at the forthcoming Hendon Display. The squadrons concerned are Nos. 15, 18 and 57, and the machines are "Harts." Service flying kit of to-day makes an interesting contrast to the well-remembered fashions of 1916-18. BOMBERS INTO FIGHTERS: The "Harts" (525 h.p. "Kestrel" I.B.) of No. 601 (County ot London) Fighter Squadron display their new markings - alternate triangles of scarlet and black. 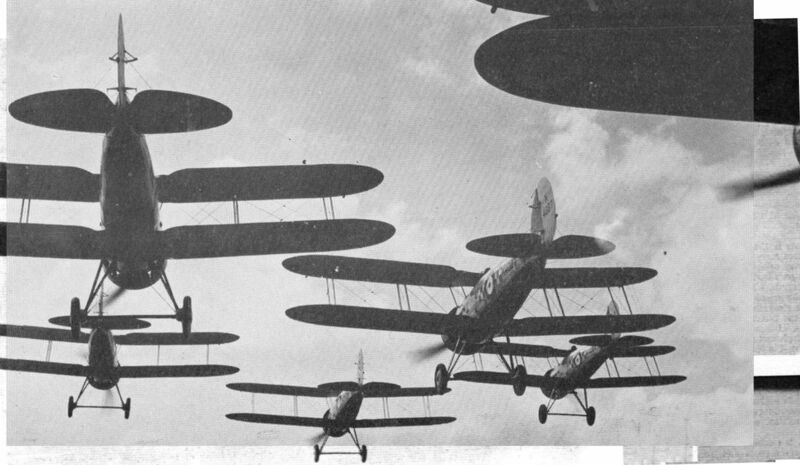 These were adopted when the unit undertook fighter duties; formerly, of course, it was a bomber squadron. "Demons" are soon expected. FOR THE KING'S CUP. In the maker's works at Reading this racing "Hawk Major" two-seater is nearing completion. Fitted with a boosted "Gipsy Major" giving 146 h.p., it will be flown by Mr. Cook, who competed in last year's event on a "Gipsy Swift." The new machine has a coupe top which gives it exceptionally good lines, and it should do well. NON-STOP TO BUCHAREST is the aim of Mlle. 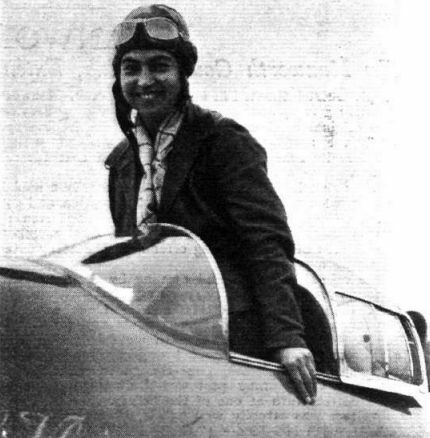 Braescu, who is to leave Croydon in the near future in a special Miles "Hawk Major" ("Gipsy Major"). The machine, which is named Aurd Vlaicu after the first Rumanian pilot, is a single-seater with coupe top, and is equipped to carry 100 gallons of fuel, giving a range of 1,500 miles. CABIN COMFORT: Signor Parodi, the pilot of a Miles "Falcon," is congratulated after winning the Raduno Sahariano in Tripoli. 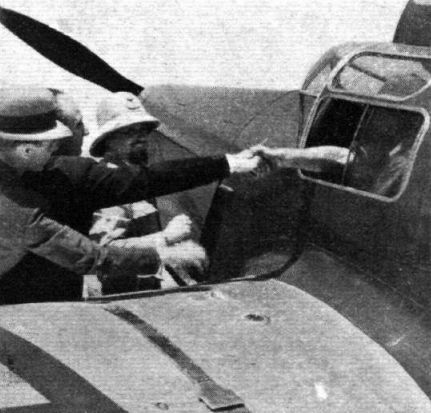 General Balbo, in a sun helmet, can be seen beside the engine cowling. The "Falcon" was the only English machine in the Rally. The backbone of our day-and-night fighter equipment - the well-tried Bristol "Bulldogs," which have been used by the majority of fighter squadrons during the past few years. No. 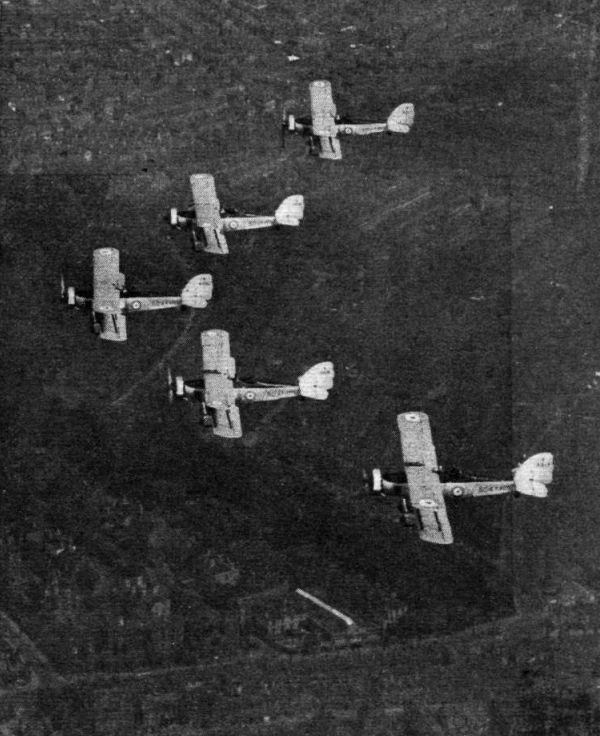 54 (Fighter) Squadron, flying Bristol "Bulldogs" ("Jupiter" engines), rallying after an attack on the "Southamptons" (Napier "Lion" engines) of No. 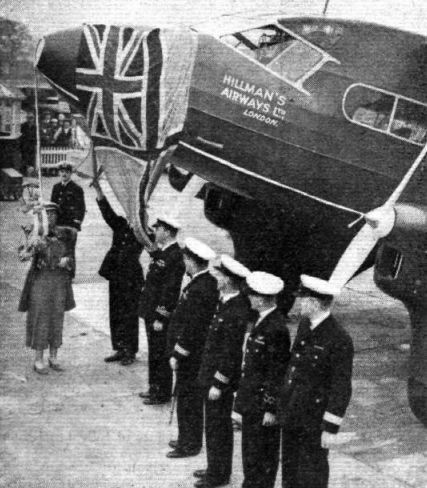 204 (Flying-Boat) Squadron. 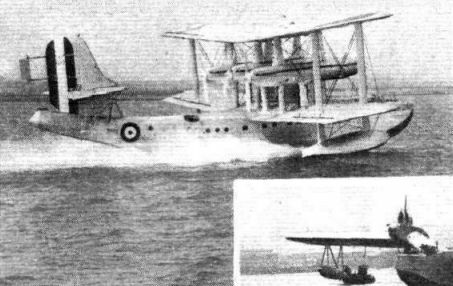 One fin and rudder of a flying boat appears to the left of the picture. A. "Southampton" attacked from the rear by a "Bulldog," as seen from another boat of No. 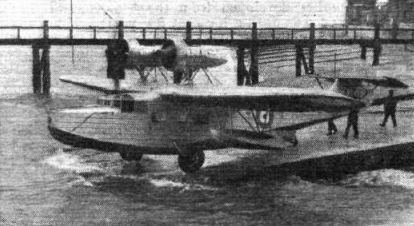 204 (Flying-Boat) Squadron. "Bulldogs" of No. 54 (Fighter) Squadron attacking a "Southampton." 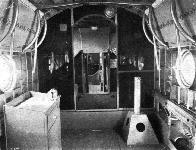 This photograph shows the view from the front cockpit of the flying-boat. 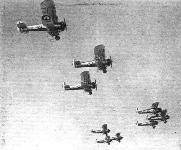 Above the tail plane is one "Bulldog" turning to break away after attacking, while another can be seen below diving out of range. 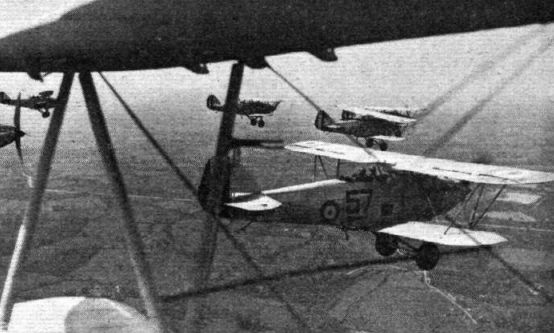 Gloster "Gauntlets" of No. 19 (Fighter) Squadron - the latest and fastest type of fighter in service in the world. Its top speed at 15,800 feet is 230 m.p.h. 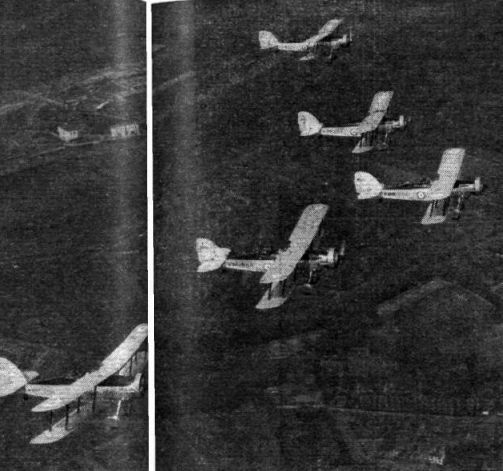 These remarkable Flight photographs were taken from a two-seater "Bulldog" which flew as a member of the single-seater formation. A FRENCH VISIT: Four bombers of the Marcel Bloch type arrived at Northolt on Monday on a visit to the R.A.F. Gen. R. Massenet de Marancour is in command. They were met by A. V-M. Joubert de la Ferte. TRULY RURAL: A Westland "Wessex" of Cobham Air Routes coming into L'Eree aerodrome in Guernsey. An accurate approach is obviously necessary, but one doubts if the pilot is really cutting things as fine as would appear from this picture. Two 620 h.p. "Pegasus" radials power the 152 m.p.h. "Overstrand" medium bomber. 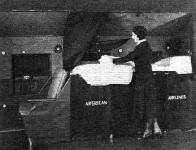 These large, comfortable berths make it easy to sleep while flying at night in a Curtiss "Condor" on American Airlines. The Gloster "F.7/30" four-gun single-seater fighter (Bristol "Mercury") will be seen at the S.B.A.C. Display. 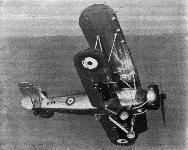 It is here seen in inverted flight, piloted by Mr. P. E. G. Sayer. 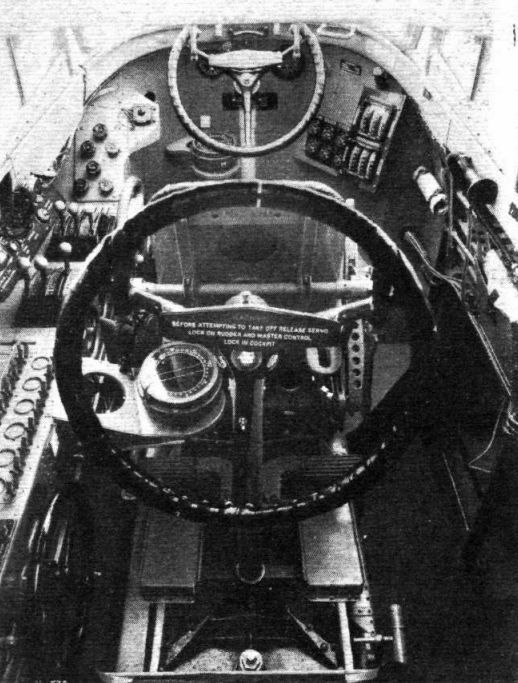 The "Fury" single seater is fitted with the 525 h.p. supercharged water-cooled "Kestrel." Mr. Brie, with the help of a fair wind, shows exactly what the C.30 can do. The "Rota" (140 h.p. "Civet I") has a number of qualities suiting it to army co-operation requirements. POETRY OF ACTION: This graphic picture of the new "Mercury"-engined "Gauntlets" of No. 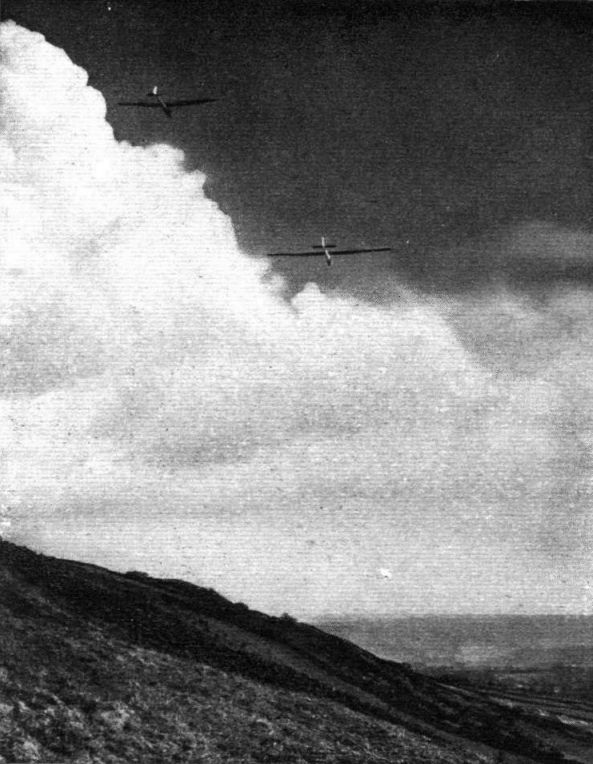 19 (Fighter) Squadron in a concerted dive was secured by a Flight photographer from a two-seater "Bulldog" flying as one of the formation. The air drill by this unit - in all probability the best equipped of its kind in the world - will form a high-light in a brilliant programme at Hendon next Saturday. 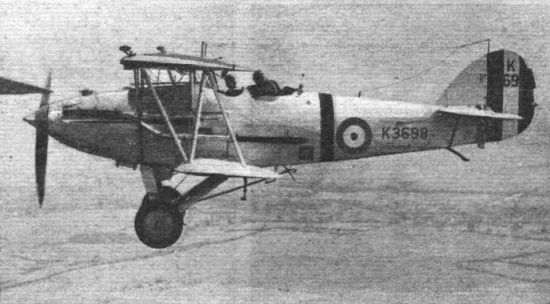 A standard type, which equips the majority of army co-operation squadrons, is the "Kestrel"-engined "Audax". The "Cloud," another Saro product is an amphibian used for navigational training. 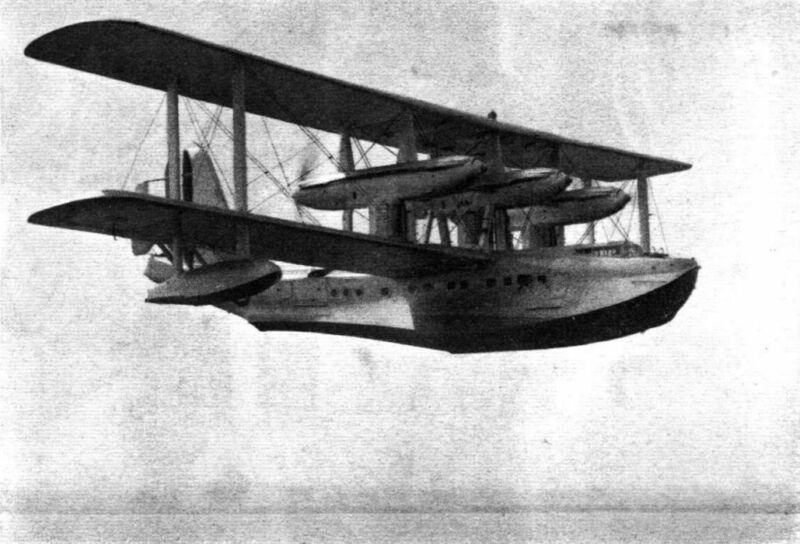 The Vickers-Supermarine "Seagull V" pusher amphibian flying boat, with Bristol "Pegasus" engine. 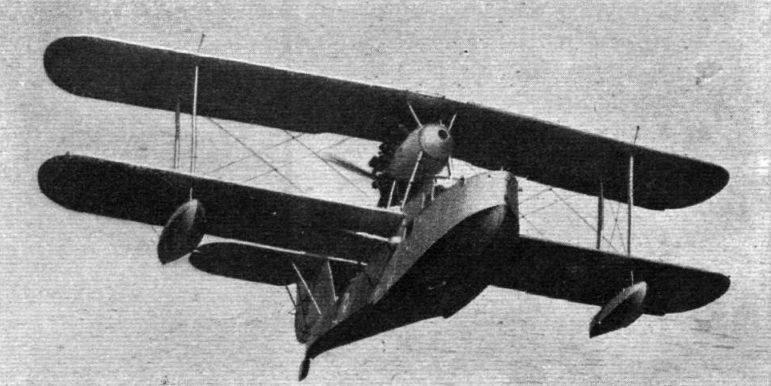 This is the first photograph taken of the new Sikorsky S.43, which, although it is an amphibian, can carry fifteen passengers and 550 lb. of mail for a distance of 1,000 miles at 165 m.p.h. 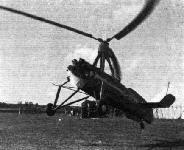 SIKORSKY S.43 Two PRATT AND WHITNEY S1EG GEARED "HORNETS" OF 750 H.P. 24 марта 1935г. : компания "Avro" впервые подняла в воздух прототип модификации своего самолета Type 652, приспособленный для прибрежного патрулирования - Type 652A, K4771. Прототип Anson сохранил квадратные окна кабины Type 652, на смену которым у серийных самолетов пришла характерная "оранжерея". Конструкция ветрового козырька также подверглась незначительным доработкам. 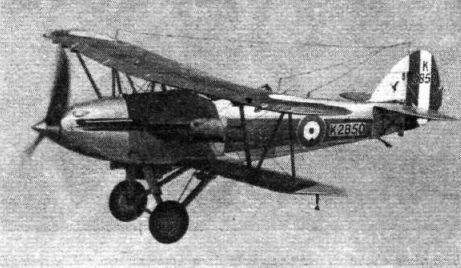 A Coastal Reconnaissance machine, the Avro 652 (Conversion) is the military version of the firm's commercial monoplane. It has two Siddeley "Cheetah VI" engines of 290 h.p. each. 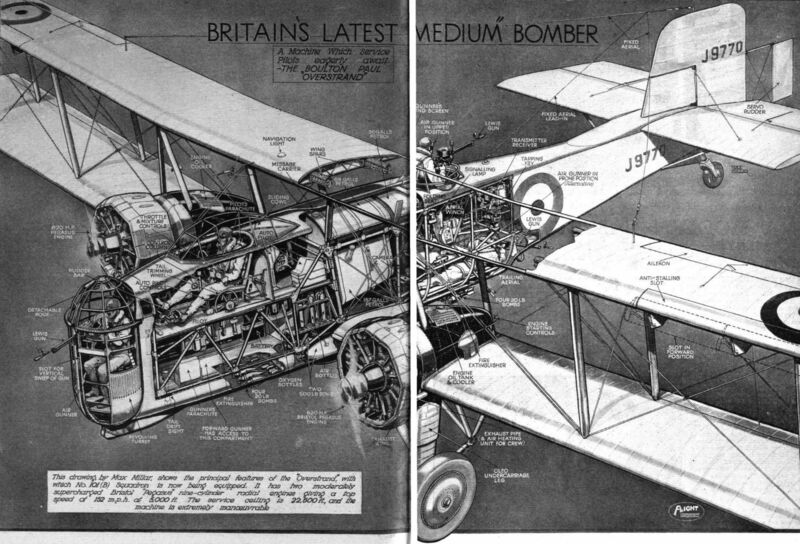 The Bristol Troop Carrier, unlike most modern machines, is a high-wing monoplane. The engines are Bristol "Pegasus" of 700 h.p. each. 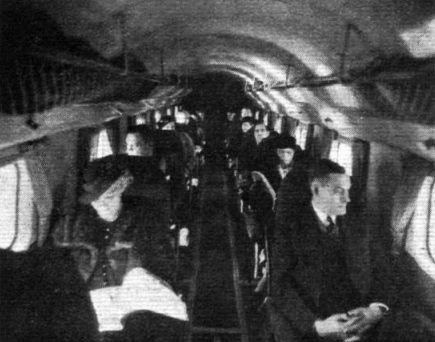 A view showing twelve of the fourteen passengers inside a standard Douglas D.C.2. as used by the majority of America's air transport companies. 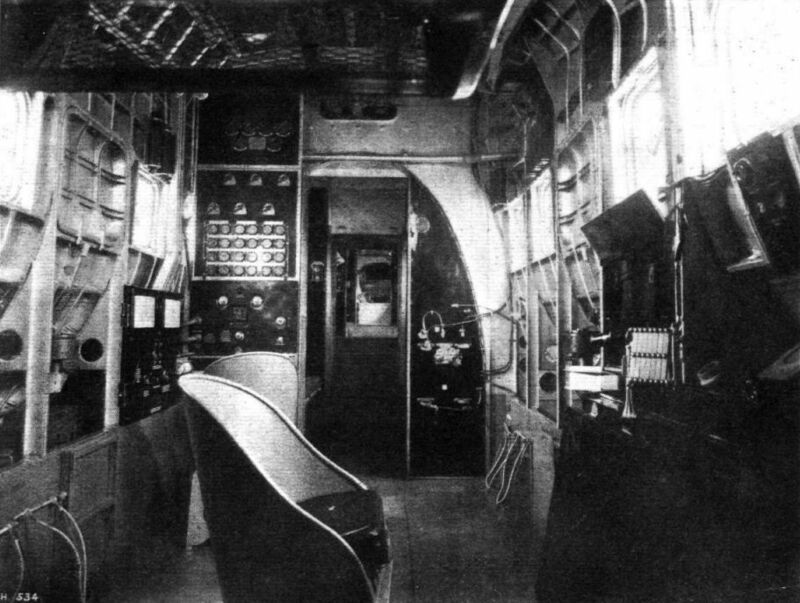 ON THE MARSEILLES SERVICE: One of the new Potez 62 monoplanes which are being used on Air France's Paris-Lyons-Marseilles run, reducing the time for the journey by half an hour. The machine carries fourteen passengers and a steward. A fast fighter. 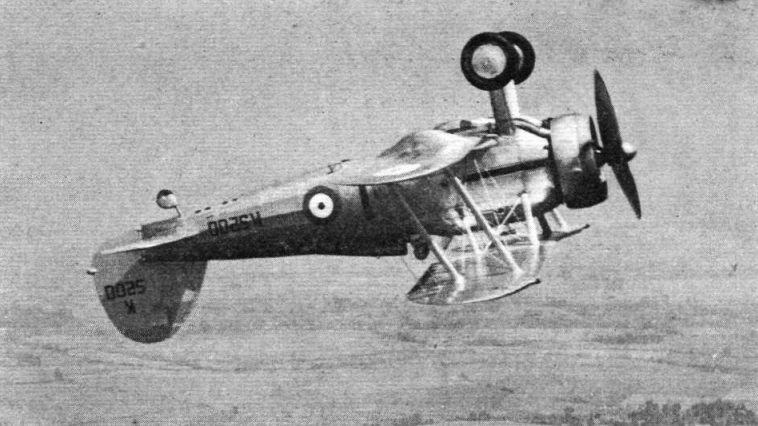 The Fairey "Fantome" (860 h.p. 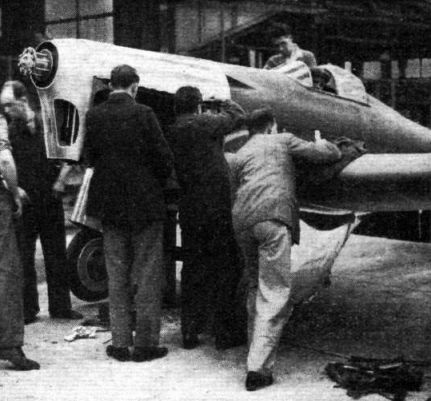 Ycrs Hispano-Suiza engine) built for a single-seater fighter competition being held by the Belgian government. No performance figures are available, but one stipulation of the competition is that machines must be capable of at least 250 m.p.h. 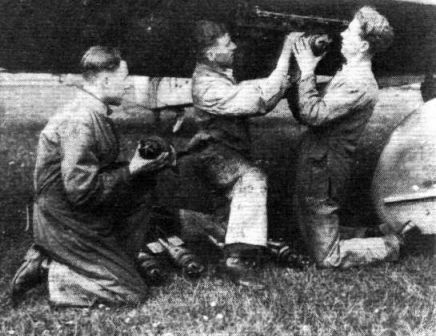 The armament includes four machine guns and the "cannon" which fires through the airscrew shaft. 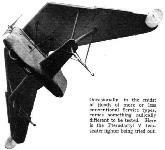 The Tipsy "S" is an extremely pretty little aeroplane. SCHOLASTIC. 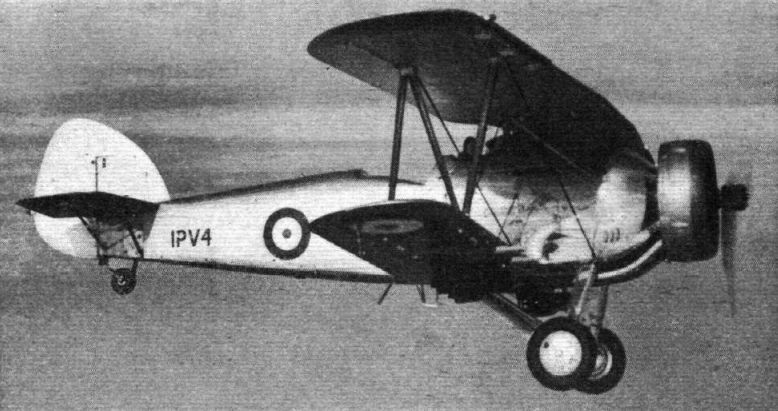 This special version of the Avro "Tutor" (215 h.p. "Lynx") built for Royal Air Force use, and known officially as the "Prefect," is to be used initially for navigational training; a number are on order. Increased tankage appears to be a feature. F/O. G. King's machine snapped during the hectic display which he gave in company with F/O. 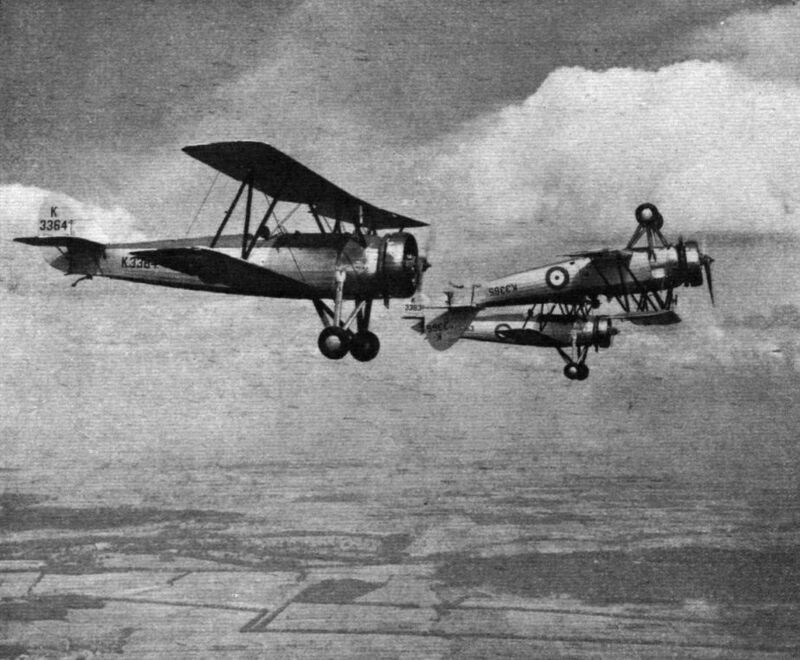 V. Moon; both flew "Tiger Moths." Flt. 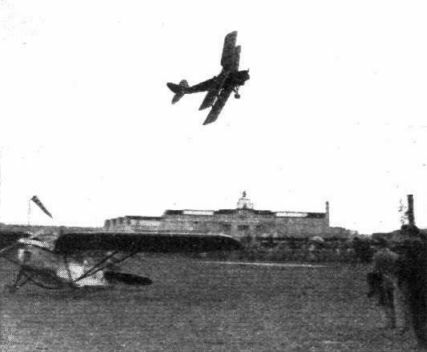 Lt. Johnson makes a final circuit - dead on time - around the Hatfield beacon after his aerobatic display with the "Tiger Moth." 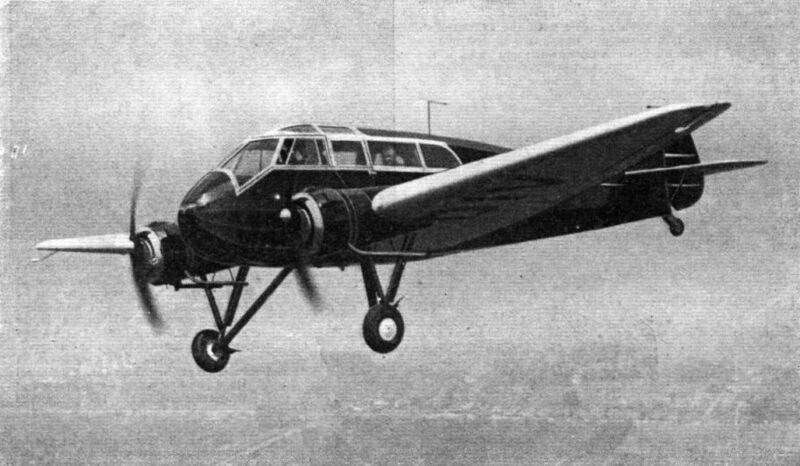 HILLMAN'S BIGGEST: The first of the three D.H. 86 machines ordered by Hillman's Airways for their Paris service taken by a Flight photographer while it was flying above the clouds near Hatfield. This machine is fitted with full dual control though the later 86 's will have the swing-over type. Lady Cunliffe-Lister christens Hillman's first D.H.86. Capt. 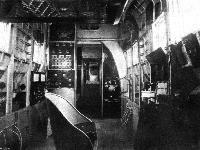 T. N. Stack can be seen, with the chief pilot, Capt. Anderson, beside him, standing beneath the nose. 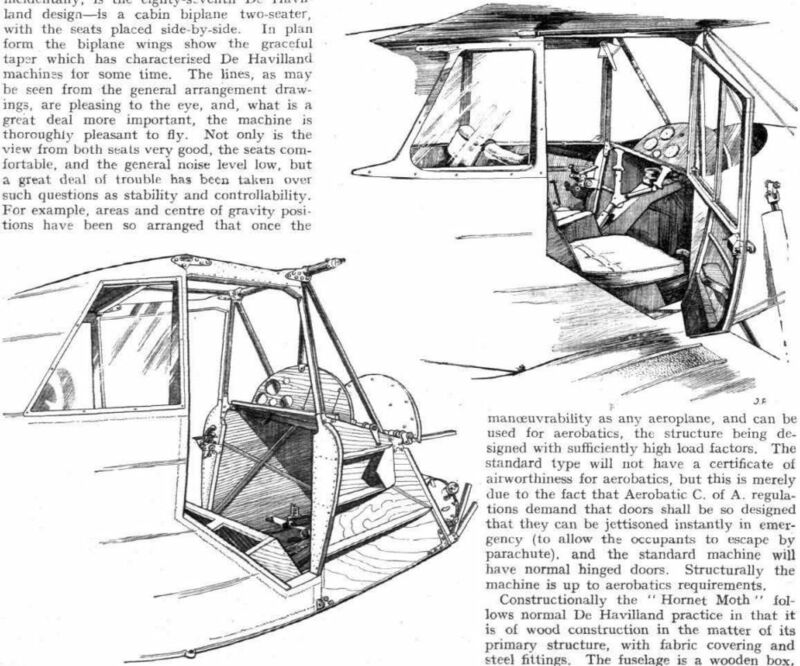 A NEW DE HAVILLAND MACHINE: The "Hornet Moth" (130 h.p. "Gipsy Major") is a side-by-side two-seater. It will be seen for the first time at the S.B.A.C. Display. 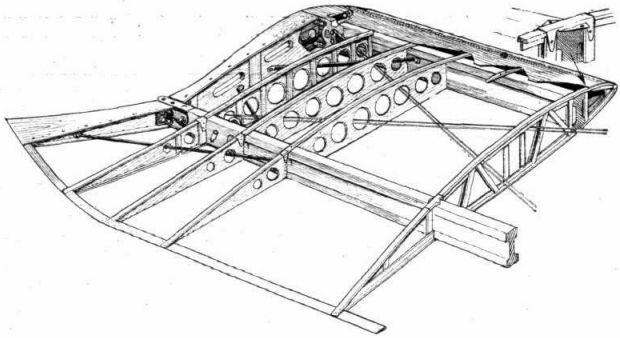 The forward part of the fuselage structure. The box on which the seats rest can be used for carrying tools, batteries, etc. The finished cabin is shown in the upper sketch. The right-hand control handle is detachable. 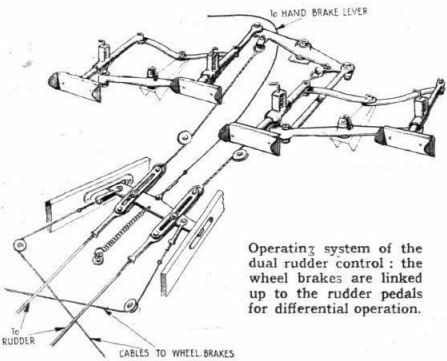 Operating system of the dual rudder control: the wheel brakes are linked up to the rudder pedals for differential operation. 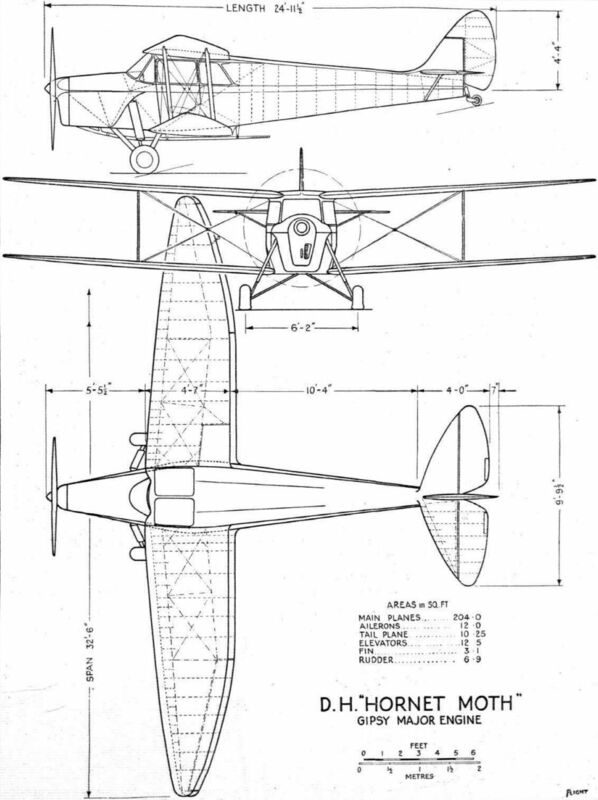 The wing construction of the "Hornet Moth" is of wood. The root of the lower starboard wing is shown, with trailing edge raised to meet the corner of the fuselage. 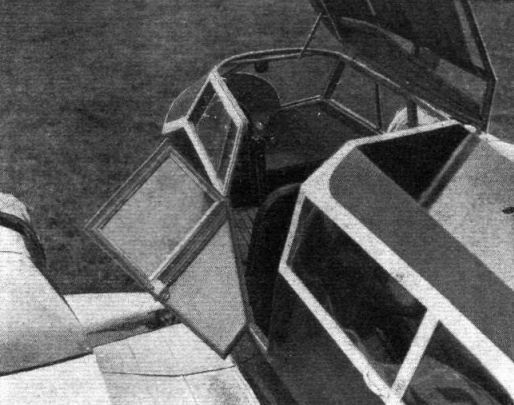 The tail surfaces are of normal De Havilland form, but trimming "tabs" are fitted on the elevators and the tailplane is fixed. The right-hand sketch shows the tailplane structure. 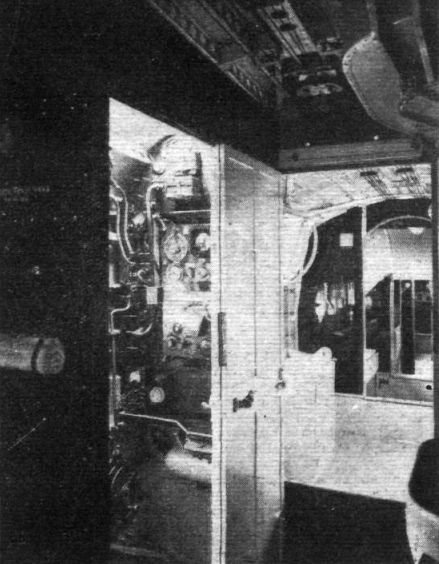 The cabin door arrangement; the new curved screen is also visible. 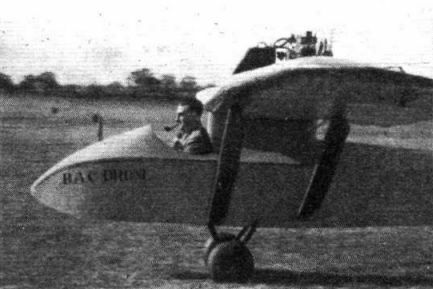 The "Demon" two-seater is fitted with the 525 h.p. supercharged water-cooled "Kestrel." Two-seater fighters were much used during the war and were re-introduced into the R.A.F. a few years ago. 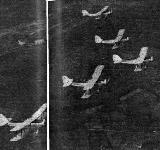 The "Demon" is the standard type, and the picture shows a flight of "Demons" of No. 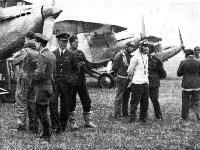 23 (Fighter) Squadron, which is stationed at Biggin Hill. Capt. Percival leaving Gravesend at 1.30 a.m. He reached Oran at 8.40 a.m., left at 11 a.m., and reached Croydon at 6.20 p.m. CLAIMING THEIR RIGHTS: An amusing incident at the recent rally of model aero clubs at Sywell Aerodrome. Several petrol-driven models appeared, and the realistic Percival "Gull" in the foreground made the best performance in this section. A LOW-WING CONVENTION. 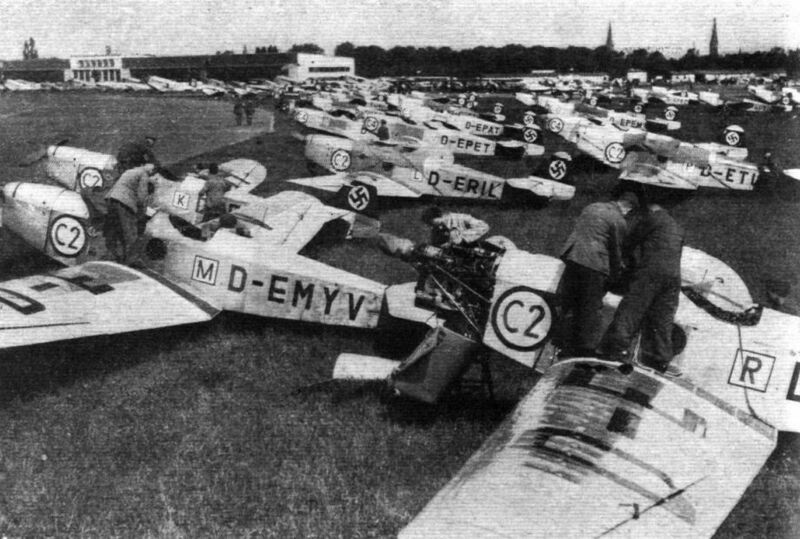 This striking photograph, taken at Tempelhof, shows some of the 154 machines which took part in the recent Deutschlandflug (Circuit of Germany). 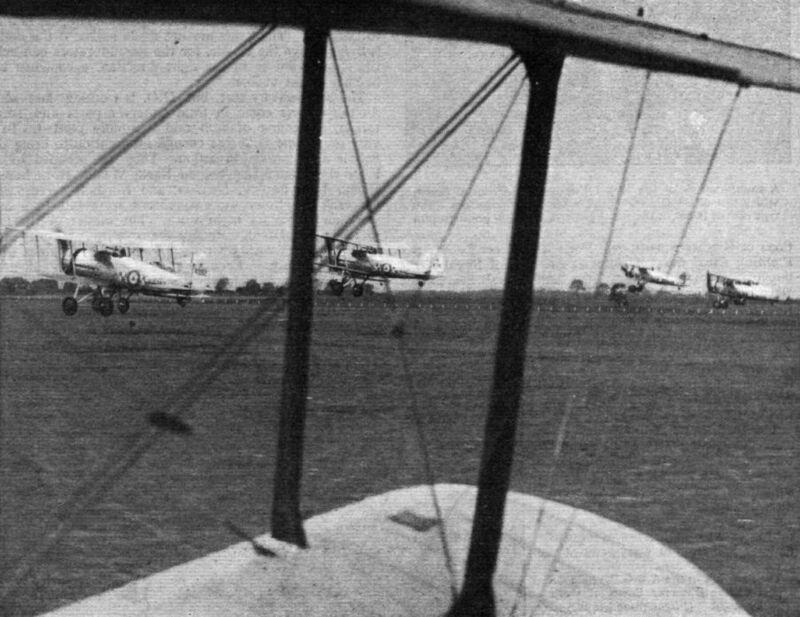 In the foreground are a number of Klemms, a squadron of which, as reported last week, carried off the principal award. 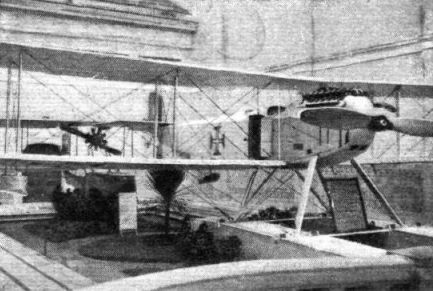 The S.42 at Miami. 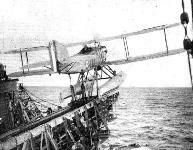 The rails on which this platform is raised can be seen; a few moments later the platform was level with the quay and the S.42 was pulled off into the hangar by a small motor tractor. 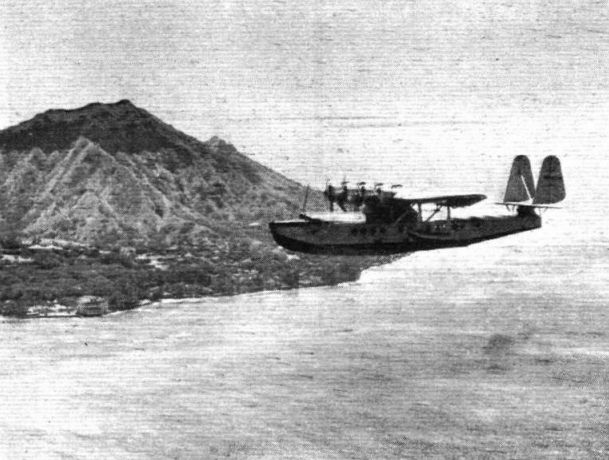 The Brazilian Clipper (Sikorsky S.42) off Honolulu during a trans-Pacific flight. TOWARDS THE IDEAL: In Flight of December 6, last year, a new type of pusher for private owner use was described. 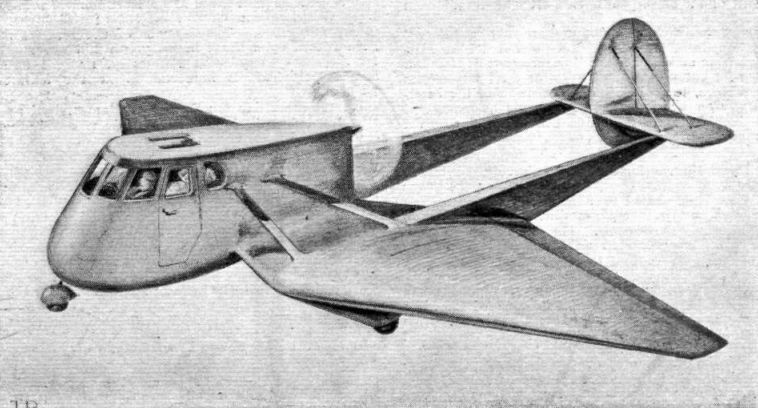 This machine the Hammond Model Y, was designed to the order of the U.S. Bureau of Air Commerce, and its various novel features can be gathered from this sketch. 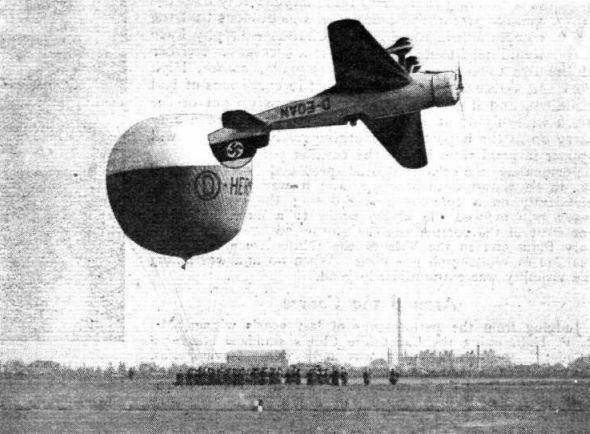 BALLOONACY: Flying a Messerschmitt monoplane, Herr Stor, the German stunt pilot, entertained the Deutschlandflug spectators by a display of low-altitude inverted flying. A balloon-bursting competition might have enhanced the effect. 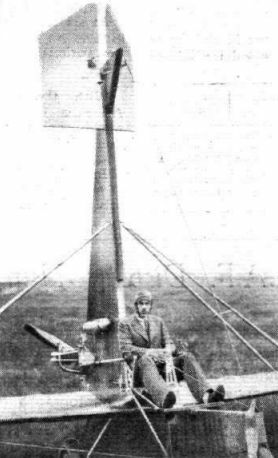 A two-seater, the "Osprey" uses a moderately-supercharged "Kestrel" of 525 h.p. Formations of No. 504's "Wallaces" flying over their home city of Nottingham. 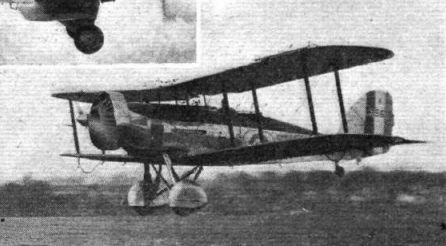 The Westland "Wallace" is fitted with the 555 h.p. 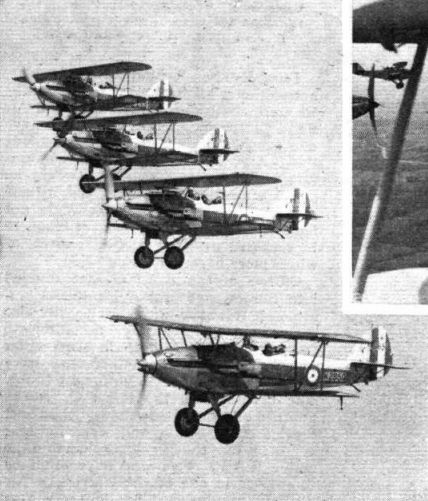 Bristol "Pegasus IM3" respectively. IN THE FLOODLIGHTS: This photograph, taken by a Flight photographer at Heston during the Household Brigade display, gives some idea of the value of modern floodlighting equipment. Those at Heston, of course, are of Chance manufacture, and the machine is an Airspeed "Envoy"
In the main hall: Over the aisle is the D.H. "Leopard Moth" in which Lt. Humberto da Cruz and Sgt. Mech. 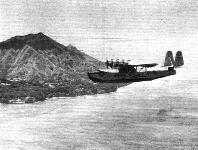 Lobato flew from Lisbon to Portuguese Timor, and suspended from the roof is the Portuguese "Varela Sid" flying-boat glider. 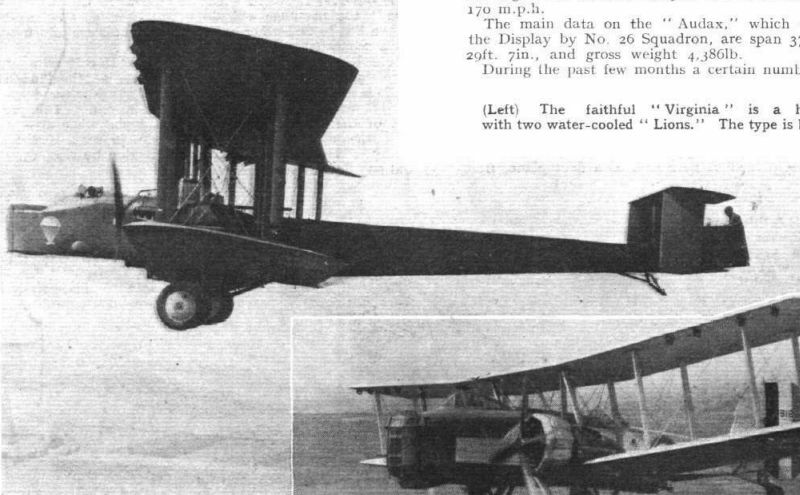 The faithful "Virginia" is a heavy bomber with two water-cooled "Lions.'' The type is being replaced. 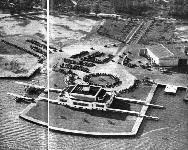 Pan-America's idea of what a flying boat terminal should be. 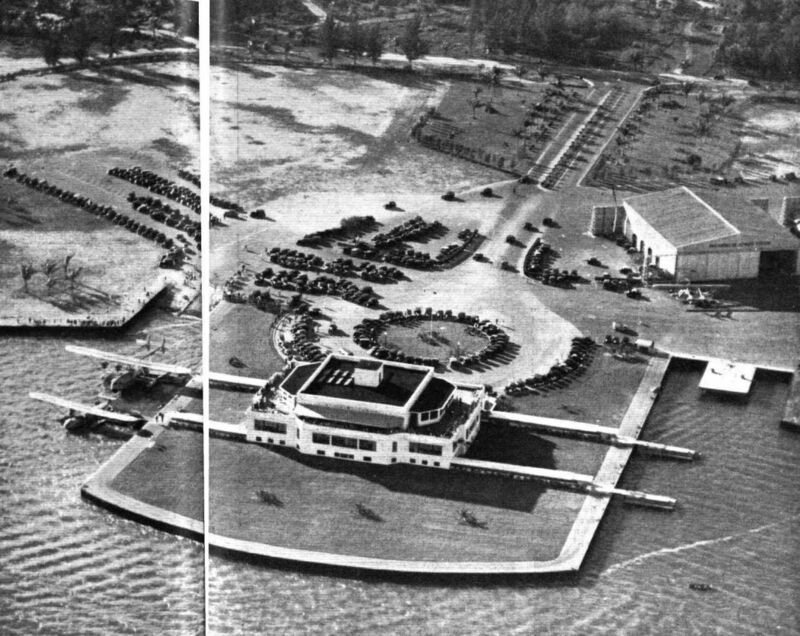 Here, at Dinner Key, Miami, four flying boats can be loaded simultaneously. 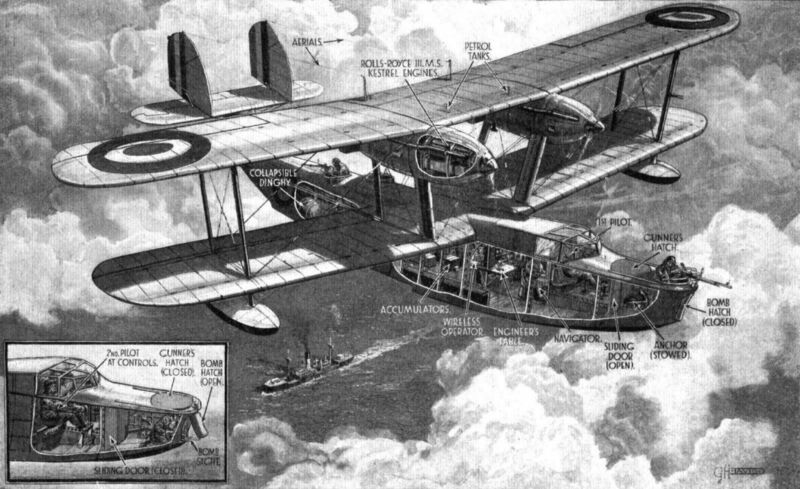 A Sikorsky S.40 and a Consolidated "Commodore" are alongside the piers on the left. 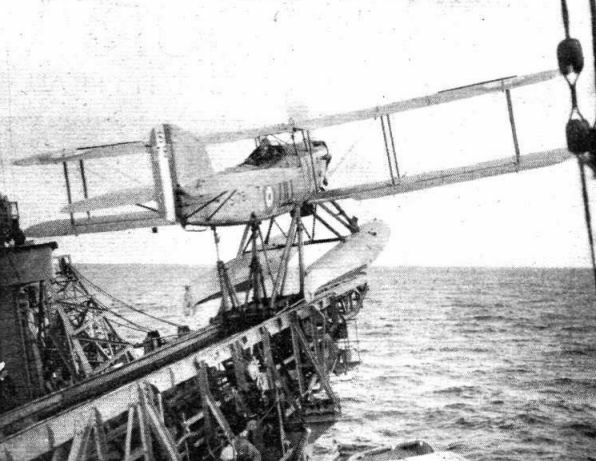 On the right can be seen the beaching platform which runs down on rails into the water and, when drawn up, lifts out the flying boat. 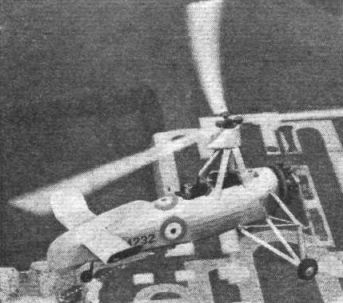 Flying scale model from Mr. L. S. Wigdor's big fleet. 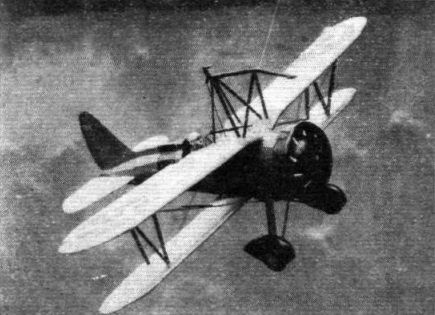 A Curtiss F.9.C.2 Macon fighter (the type carried by the ill-fated U.S. airship) of 19 1/8 in. span and weighing 2.2 oz. 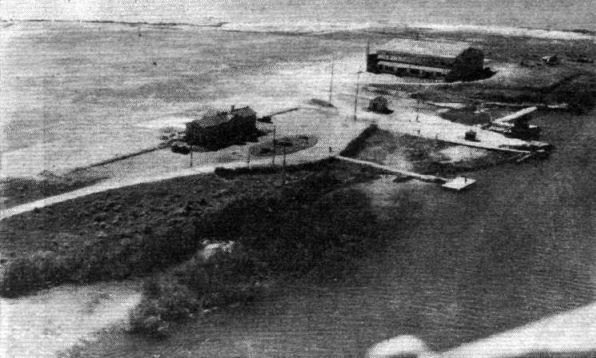 An aerial view of the landing stage and aerodrome at San Juan, Porto Rico. 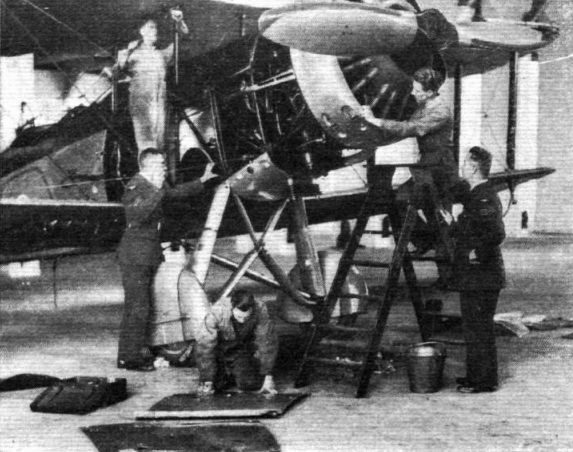 An S.40 is alongside the stage. 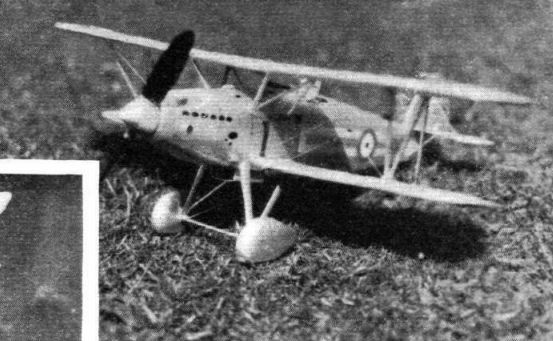 The Hawker "Nimrod" is a single-seater fleet fighter with the fully supercharged 525 h.p. "Kestrel IIS." 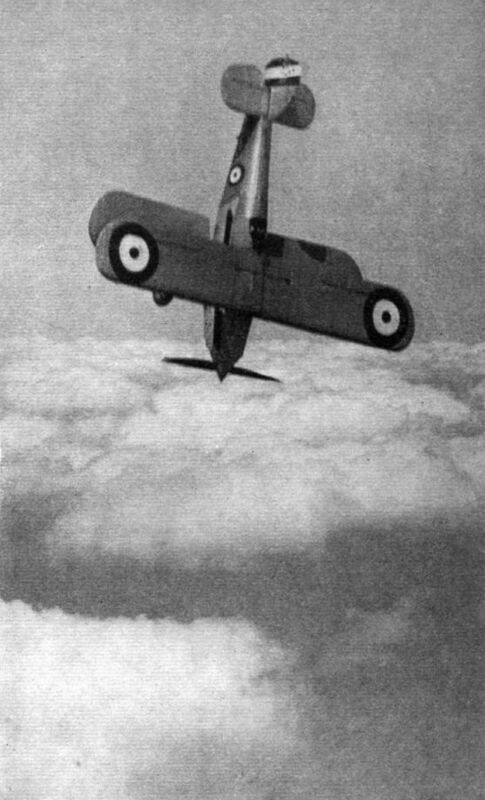 The Plummer: A "Nimrod" fleet fighter enters a terminal velocity dive in which it will reach a speed in the region of 400 m.p.h. The aircraft is just leaving the trolley, which, it can be seen, has reached the extended forward portion of the catapult, at which point it is decelerated by the liquid-controlled recoil ram. YOUNG ENTHUSIASTS, members of the Skybird League, who recently visited the new aerodrome at Southend-on-Sea as guests tf the Southend Flying Club. 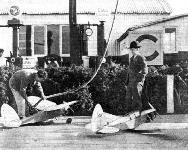 They are seen standing by the Club's Short "Scion," in which Mr. A. M. Glover (Chief Instructor) gave many of them flights. 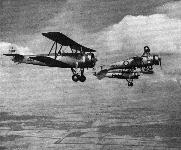 A new Bomber Transport: The Armstrong Whitworth A.W.23, which has two 800 h.p. Siddeley "Tiger VI" engines. THE LATEST: It is now permissible to publish a photograph of the new Armstrong-Whitworth Bomber Transport - a low-wing cantilever monoplane with retractable undercarriages. The engines are Siddeley "Tigers." 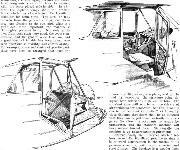 Side and head-on views of the "Archaeopteryx" - an unconventional semi-tailless machine which first appeared in 1930 - in which Sir Philip Cunliffe-Lister and Lord Trenchard showed great interest. Mr. E. D. Ayre sets off, pipe in mouth, to give a demonstration of the impossible - with the B.A.C. "Drone." Occasionally, in the midst of floods of more or less conventional Service types, comes something radically different to be tested. 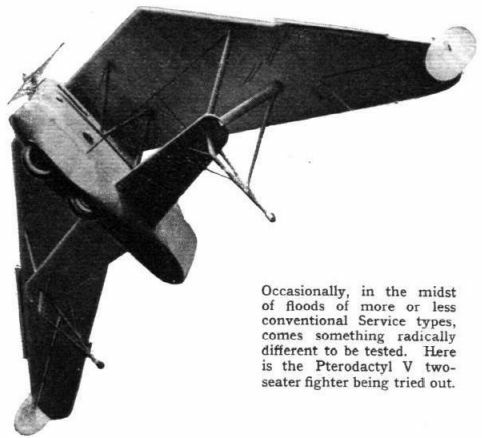 Here is the Pterodactyl V two-seater fighter being tried out. 1931 was the year in which it seemed the estimable Capt. 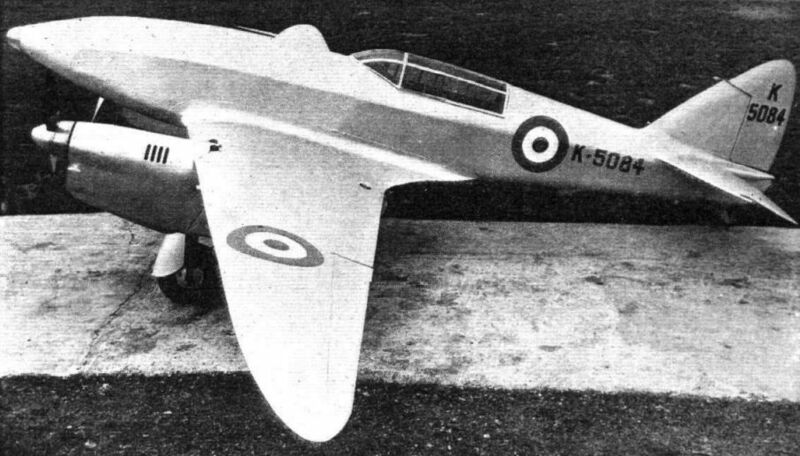 Hill's efforts were to be rewarded, when his two-seat Pterodactyl Mk.V proposals gained Air Ministry acceptance, with the one proviso that the machine be powered by a 600hp Rolls-Royce PV.G, later known as the Goshawk. With the relevant paperwork completed, work on the sole Mk. 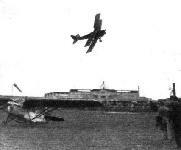 V, K 2770, commenced in early 1932, against Air Ministry Specification F.3132. Completed in the autumn of 1932, K 2770 started taxiing trials, only to have the left wing collapse. The cause of this was traced back to a design stressing error, which had been unearthed by a bump on the grass airfield. 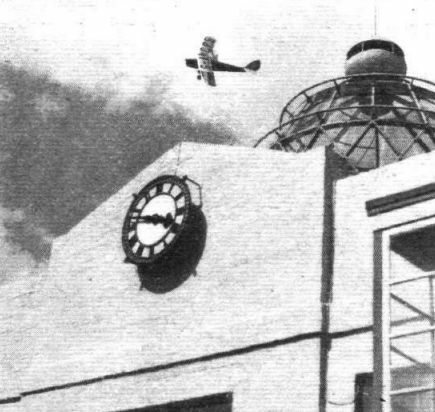 Thus, another sixteen months were to pass before the machine actually took to the air for the first time, in May 1934. 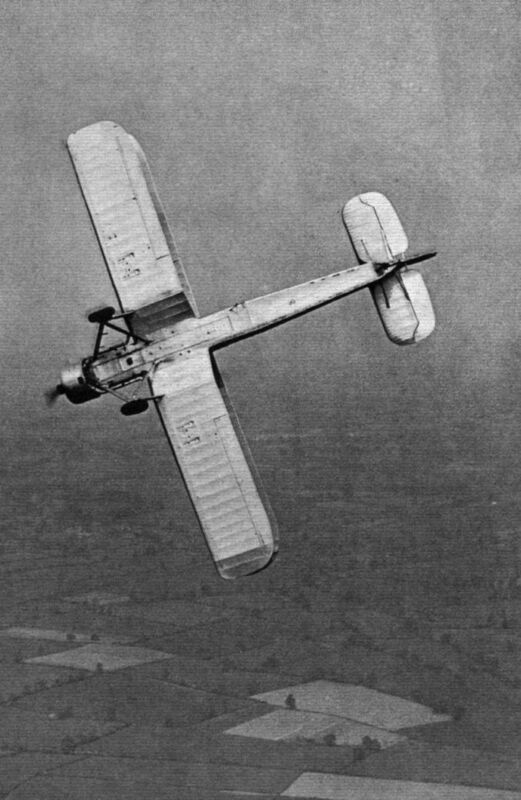 Dogged by the now traditional pitch control sensitivity problems, an unreliable engine and a top speed of 165mph at 15.000 feet, nearly 20mph slower than that of the RAF's then standard Hawker Hart day bomber, it is little wonder that the whole project was quietly abandoned. 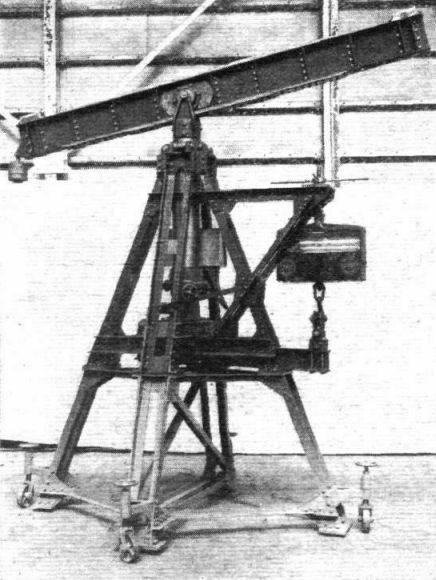 One of the jacks used for lifting the flying boat off the ground when it is ashore. The ends of the beam are placed under points on the lower wing roots. Although dual controls are provided, the pilots are arranged in tandem to give the first pilot the best possible view. A view looking forward. 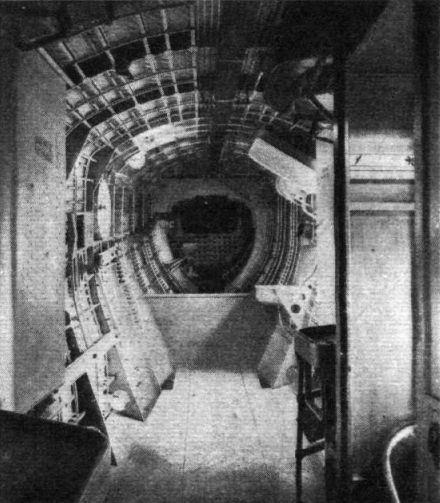 The compartment in the foreground has a workbench with vice, etc., and a hatch through which can be lowered a spare engine. The picture affords a peep into the W/T compartment. The exchange: In this compartment are the switchboard for the electricity supply, telephones, etc., and the engine instruments under the care of the engineer. 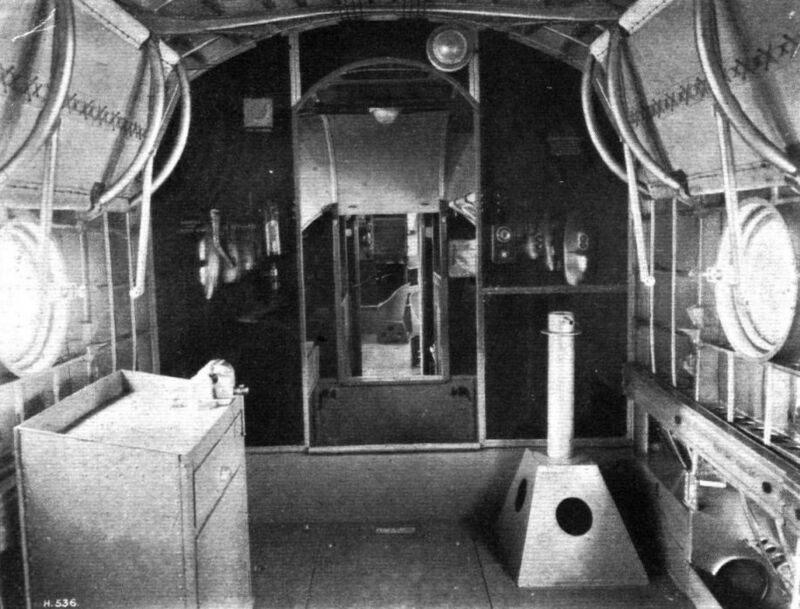 The aft stowage space, and lavatory equipment. A gangway leads to the gun position in the extreme stern of the hull. 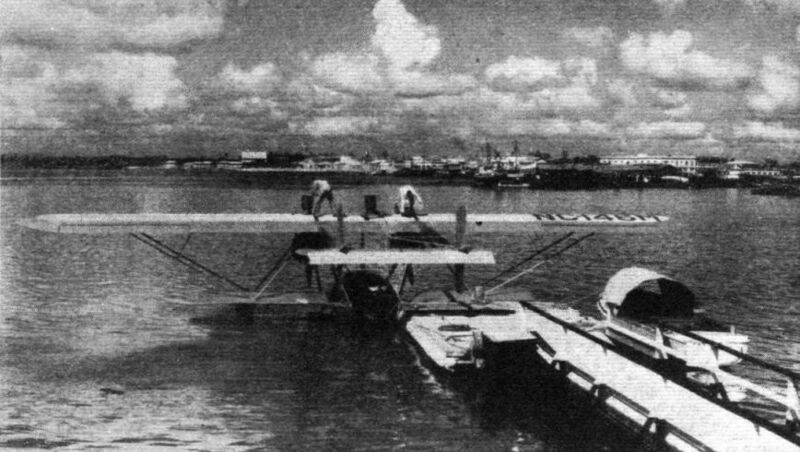 A Sikorsky S.38 alongside a typical landing stage, at San Juan, Porto Rico. 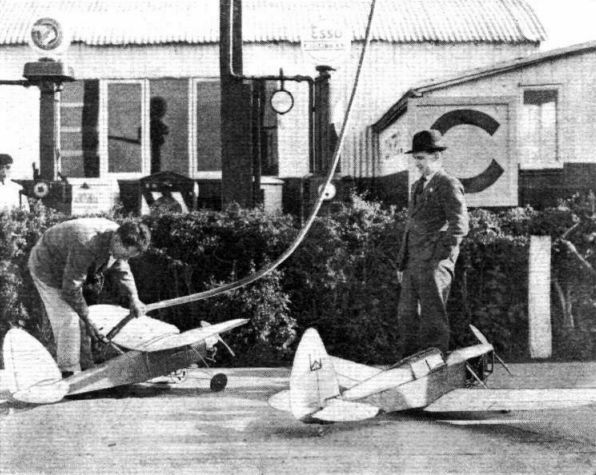 The tanks for both engines are being refuelled simultaneously. 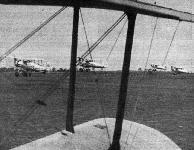 Among the seven flying boats which are to appear at the R.A.F. Display on Saturday is the Vickers-Supermarine "Scapa," which is now being used in considerable numbers; its duties include reconnaissance, bombing, and navigational training. The engines are two Rolls-Royce "Kestrel III M.S." (525 h.p. moderately supercharged vee-twelve water-cooled); the span is 75 ft. and overall length 53 ft. This part-sectional drawing by G. H. Davis shows the layout of the crew accommodation and principal features. An Armstrong Whitworth general-purpose biplane shows her mettle during handling tests. The Handley Page H.P.47 General Purpose monoplane (700 h.p. Bristol "Pegasus" engine). 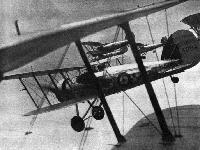 The Hawker "P.V.4" General Purpose and Dive Bomber aeroplane. The engine is a 700 h.p. Bristol "Pegasus." THE BOMB-THROWER: It is now possible to disclose the nature of this new "Pegasus"-engined Hawker machine, which was first illustrated in Flight last February. 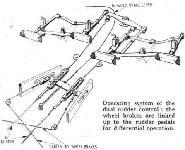 Although a general-purpose type, it has been specially designed for dive bombing, and for this work is claimed to be superior to any foreign design. Its designation is P.V.4, the letters, of course, signifying "private venture," i.e., not built to any particular Air Ministry specification. SANS QUEUE. 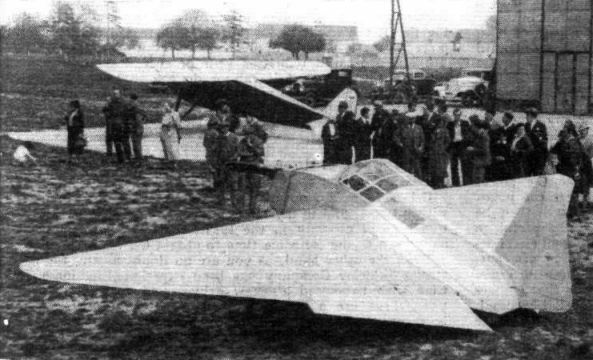 The latest French contribution to the "flying flatfish" cult, M. Fauvel's machine has a 75 h.p. Pobjoy engine, giving a top speed of 115 m.p.h. TAILS UP! This weird machine, built in France by the Vicomte Charles de Rouge, is claimed to have helicopter-like qualities. The tail surfaces appear to be hinged and to give longitudinal control. 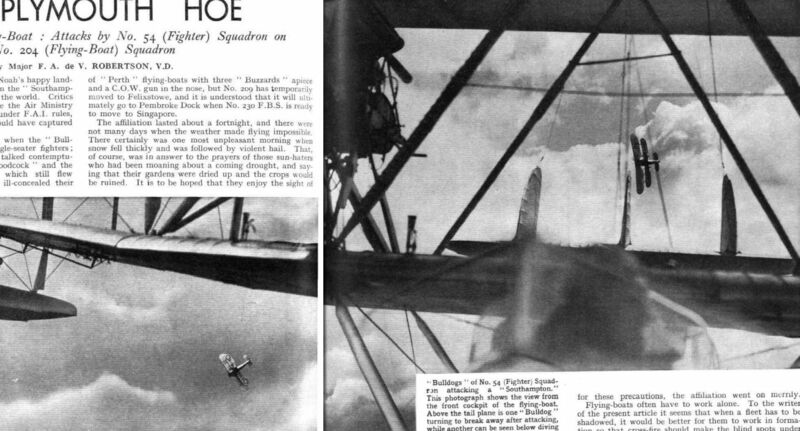 The new Hawker "P.V.3" is a four-gun single-seater fighter with Rolls-Royce "Goshawk" engine. Its performance is said to be "Schneiderish."